President Abdel Fattah al-Sisi on Sunday morning met with Donald Tusk, President of the European Union (EU), during the sidelines of the first Arab-European summit in Sharm al-Sheikh. Sisi stressed the important position of the EU in Egypt’s foreign policy, which is based on mutual respect and appreciation for other parties not only because the EU is Egypt’s prime trading partner but because the two sides have deep-rooted relations and common challenges that they face on both sides of the Mediterranean, Presidency Spokesperson Bassam Rady said. 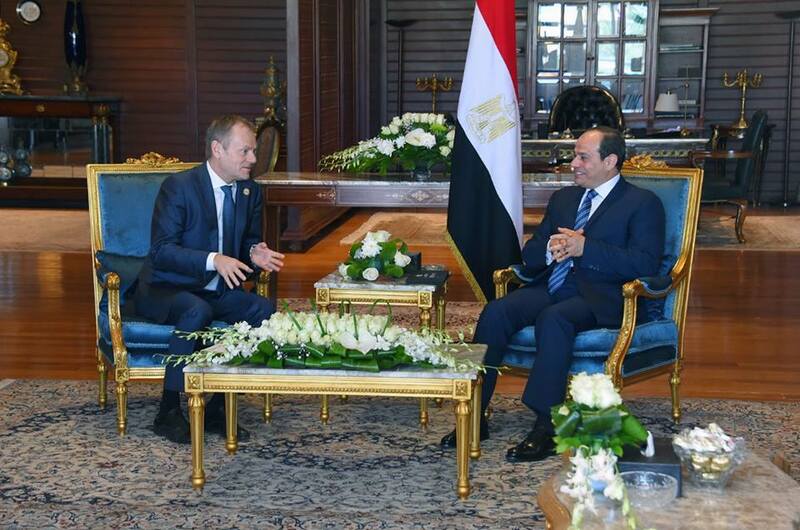 Tusk expressed appreciation for Egypt’s distinguished historical relations with the EU, stating his pleasure in visiting Sharm al-Sheikh and meeting with President Sisi on the side of the summit. According to Rady, Tusk said that choosing Egypt to host such an event reflects the political weight it carries internationally and regionally, being a link between the Arab and European worlds as well as an oasis of security and stability in the region, which is currently in a critical phase of extreme turmoil. The two leaders reviewed various aspects of the EU-Egypt relations in terms of political, economic and developmental dimensions, expressing satisfaction with the overall institutional cooperation between the two sides and also stressing the importance of continuing joint coordination and mutual dialogue in the light of common interests and challenges, Rady said. The meeting also touched on coordination between Egypt and the European Union on several important international and regional issues such as the Middle East Peace Process and the situation in Libya, Syria and Yemen. They agreed on maintaining channels of consultation between the two sides in relation to these issues, and on continuing work on reaching political settlements so as to preserve the national institutions and unity of these countries, achieving stability and lasting peace. Rady said that Tusk was keen to praise Egypt’s efforts in the fight against illegal immigration, and stressed on the EU’s appreciation of these efforts, calling Egypt a successful model for the region in countering illegal migration. Sisi in turn expressed Egypt’s desire to enhance joint cooperation with the EU in combating terrorism, in particular addressing the main roots of extremist thought. Tusk also discussed cooperation prospects with Egypt in maintaining peace and security on the African continent, especially under Egypt’s chairmanship of the African Union. Sisi expressed Egypt’s readiness to engage with the European Union in the implementation of development projects to strengthen the capacities of African countries, especially those exporting illegal immigration through reconstruction and post-conflict, economic and social development projects, according to Rady.